Ignore the outside thermometer and this morning's 32 F weather. Ignore the frost on the deck and the dock and enjoy the sunshine. Ignore the TV weatherman and pretend that occasional snow flurries are routine Spring forecasts. Enjoy Spring-in-a-Bucket on the kitchen table and be happy this is sunny Seattle, far away from the blizzards traveling across the midwest today. All of the above were easy to accomplish with Bacon Benedict on our plates this morning. 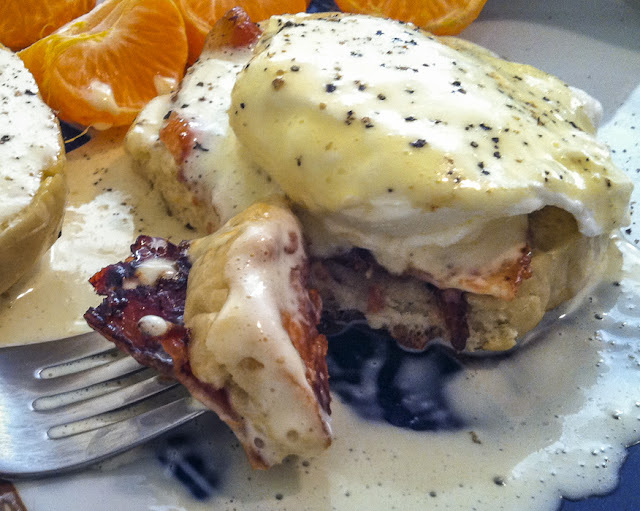 Homemade English muffins, easy blender Hollandaise (link), crisp bacon and perfectly poached eggs - oh, yum! All that was missing was some fresh asparagus, so I roasted a bunch and we enjoyed that at lunch with the leftover Hollandaise sauce. I do have a favorite muffin recipe (link), but haven't made any lately, settling instead for an occasional storebought package. Then I found some muffin rings on sale and couldn't wait to play with them. I experimented with a different English Muffin recipe last night and was eager to share the results this morning. This new recipe produced puffy, really puffy muffins. It might have been the super-enthusiastic sourdough starter I added to the listed ingredients, or perhaps I rolled the dough too thick or let it rise too long. Whatever the cause, these English muffins were overachievers height wise. They were light and delicious, with a slight tang from the sourdough, but oh! that's a lot of muffin. 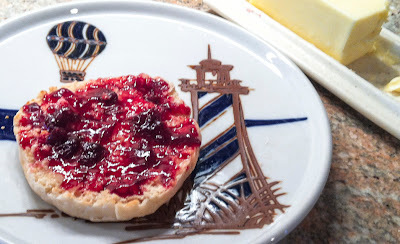 When split with a fork the crusty exterior contrasted with a crumb that was soft and open, filled with plenty of crags and crevices to capture butter, jam or lemon sauce. I think that's what I love best about English muffins, the "good stuff" hangs on and doesn't slide off onto my shirt. The remaining English muffins will be put to good use this week toasted at breakfast, used as a base for crab melts or mini pizzas, and possibly sliced into thirds or more and grilled as panini. Then I get to play with my new muffin rings for another batch. Sprinkle the yeast on top of 2 Tbsp of water to soften. Heat the milk in a microwave until it bubbles; remove and let cool to room temperature. In a large mixing bowl combine together the cooled milk, water, sugar, salt, yeast and sourdough starter if using. In several small additions gradually add 2 cups of flour and beat in. Cover with a cloth and let rise in a warm area until the dough doubles in size, approximately 1.5 hours. Beat in the softened or melted butter. Knead in the remaining 2 cups flour until incorporated. Press or lightly roll dough to a thickness of 3/4" 1/2 " and cut out with muffin rings. Let stand on lightly greased baking sheet until dough has doubled in size. Transfer muffins onto a 340 F well-buttered griddle or electric fry pan. Remove muffin rings. Cook until light brown, about 7 or 8 minutes. Turn and cook on the second side until light brown. another 7 or 8 minutes. Optional Note: For my extra thick muffins I finished them in a 350 F oven on a nonstick baking sheet for an additional 8 minutes to fully cook the centers. Cool on a baking rack. When ready to use, split with a fork along the horizontal to expose a rough surface that readily holds spreads and fillings. 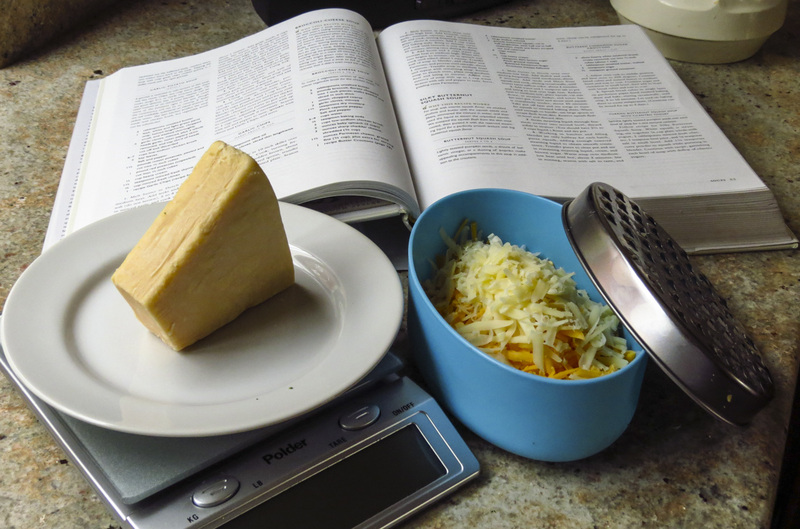 Using a knife will produce a smoother surface, less suited to grabbing the toppings. Okonomiyaki - references to it kept popping up all over the place this month. I skimmed the new Food52 cookbook at my local library and immediately stopped at their photo of this dish. (Note: If you haven't found Food52 online before, you should go there, right now, or at least soon!) Their okonomiyaki recipe was voted the "Best Street Food" by their readers in 2012. 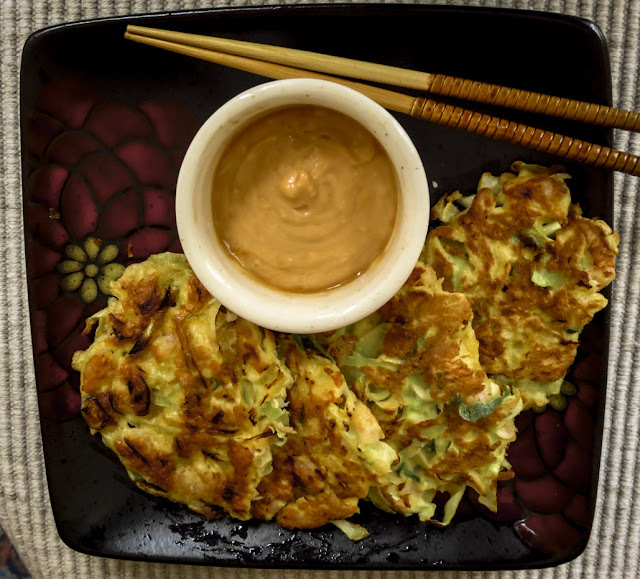 Washington Post columnist David Hagedorn featured these Japanese pancakes in his recent article, scads of Yelpers from coast to coast sought advice on the best place to eat okonomiyaki, and a Google search yielded a gazillion recipes for differing versions. I had to try it... couldn't get it our of my mind. Hopefully this pancake would turn out better than my first attempt at a Korean green onion pancakes. What is okonomiyaki? Sources agree it is a Japanese savory pancake containing a variety of ingredients. That's where the agreement stops. Toppings and batters tend to vary according to region, and the preferred size and thickness also vary. 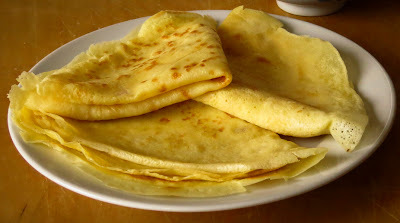 The pancake is variously referred to as a thick Japanese pizza and described as a crisped crepe; it can look more like a flat omelet or frittata. Its appearance reminds me of an Asian-flavored spaghetti pie minus the pasta. Even its origins are hotly debated, as noted in this February article in RocketNews. My version of this cabbage and shrimp pancake produced a strongly-flavored flat frittata with a zippy sauce. It worked both as finger food or more neatly consumed in smaller pieces with fork or chopsticks. I sampled a saucer-sized round and found it too unevenly cooked with a soggy center and crunchy edges. Mmmm, those crisp bits on the edges were pretty tasty, I might work on smaller/thinner/crispier. 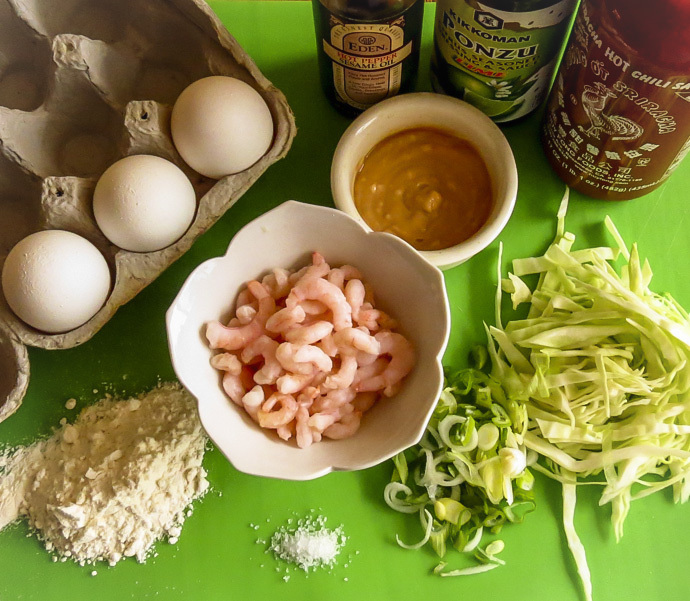 Smaller, flatter pancakes were an improvement, but the eggy batter still masked the cabbage and shrimp. Next time I might thin the batter, use less flour or adjust the filling-to-batter ratio. Okonomiyaki may not top the list as my favorite finger food, but I did enjoy them as something different for lunch. There will be a next time with these savory pancakes, as I search for a lighter, more crepe-like pancake or wrap. Preheat your oven to 200 F, to hold the pancakes as you make several batches. 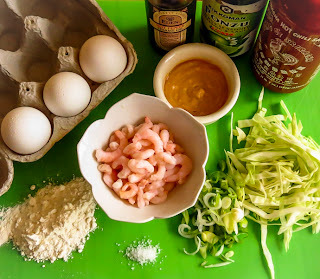 Use a medium bowl and whisk together the eggs, Ponzu, spicy sesame oil and salt if you are using any. Add the flour in several batches, whisking to blend completely after each addition. 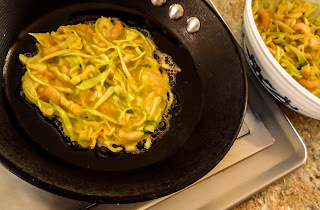 Use a large spoon (or chopsticks) to fold in the cabbage, green onions, shrimp and pickled ginger if you are using some. Drop a few tablespoons of canola oil into a medium, nonstick skillet and heat over medium-high heat until the oil shimmers. Give the batter another stir or two to mix in any egg mixture that might have settled out; add a heaping serving spoon of batter to the pan. Smooth out the batter to an even thickness, tidy up the edges if you care, and cook for several minutes until golden brown. Flip carefully and cook a few more minutes until the second side is golden brown. Keep warm, covered, in the oven as you work with the remaining batter. Note: use as a dipping sauce or add to a squirt bottle and squeeze over the pancakes. Spring is right around the corner, so close I can feel it in the air and see it in the budding greenery on trees and shrubs. 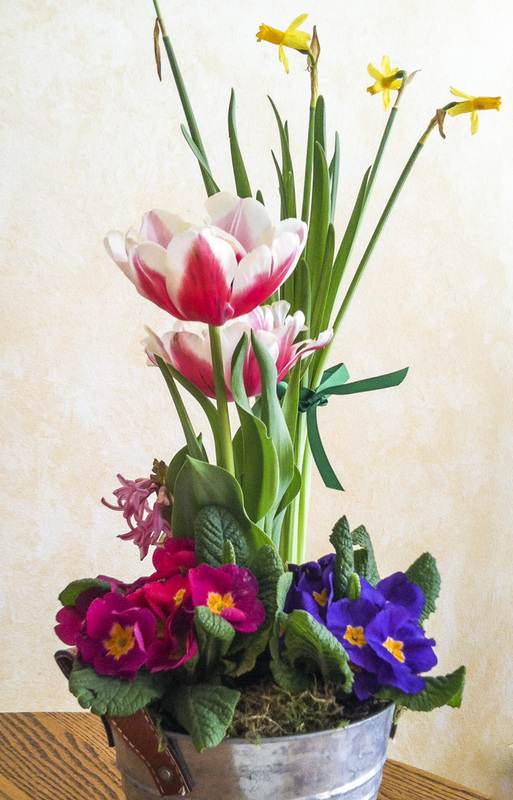 Today Spring flowers perfumed the air in my kitchen, early sentinels of the coming longer days and good weather. 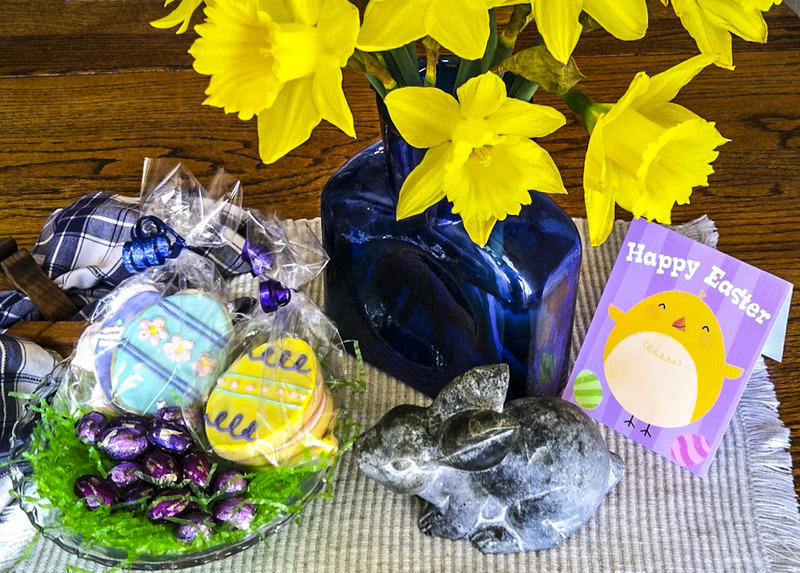 A pitcher filled with sunny daffodils prompted me to bake something equally sunny and Springlike. Lemon zest brought a citrusy note to the dough, while fresh lavender buds added their distinctive tang to the batter. 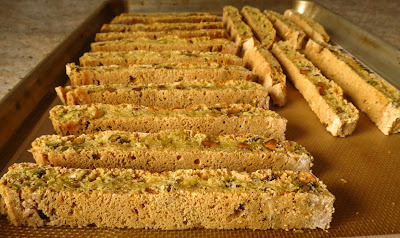 I threw in some pistachios for crunch and the stage was set for a tasty batch of biscotti. I worked with a new recipe and found the soft, wet dough challenging to shape. 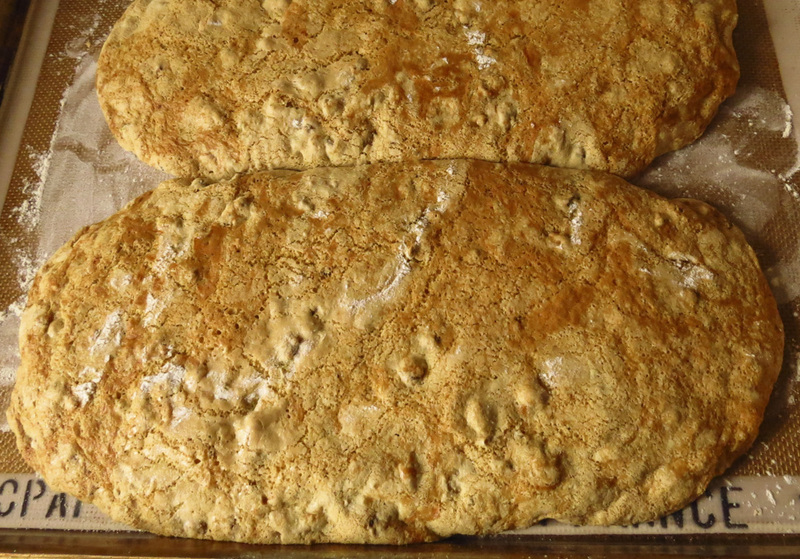 The loaves spread oozed sideways before I could get them into the preheated oven, resulting in long, flat cookie batons. Add more flour? No, because the resulting biscotti had a good texture, firm to the tooth but not overly hard and crunchy. Chill the dough before shaping? Perhaps worth a try, or I could just relax and settle for long, flat biscotti. They were crisp, tasty, and a total treat with a cup of tea or coffee. I love the subtle taste of dried lavender in cookies (link), and decided to give minced, fresh flower buds a try. The flavor was a bit stronger than with dried flowers, a little harsh on day one but it did mellow out by the following day. RL doesn't care much for culinary lavender, but he had no trouble eating these biscotti, one after another, without complaint. Preheat the oven to 350 F and line a rimmed cookie sheet with a Silpat mat or parchment paper. Mix first 5 ingredients, sugar through lemon zest, in a stand mixer until thoroughly combined. Use a second bowl to combine the flour, baking soda and salt; mix thoroughly. Add the flour mixture to the egg/sugar mix in several small batches; use low speed and mix until combined. Add the pistachios and lavender and fold in gently with a spatula. Optional: brush the top of each loaf with thinned egg white wash and sprinkle with coarse sugar. Bake for 25 to 30 minutes until golden. Remove from the oven and cool for 15 minutes. When slightly cooled, transfer to a cutting board and cut each loaf on the diagonal with a serrated knife into 3/4-inch slices. Return to the cookie sheet, cut side down, leaving space between each slice, and bake again at 350 F for an additional 10 minutes. You may need to do this in 2 batches. 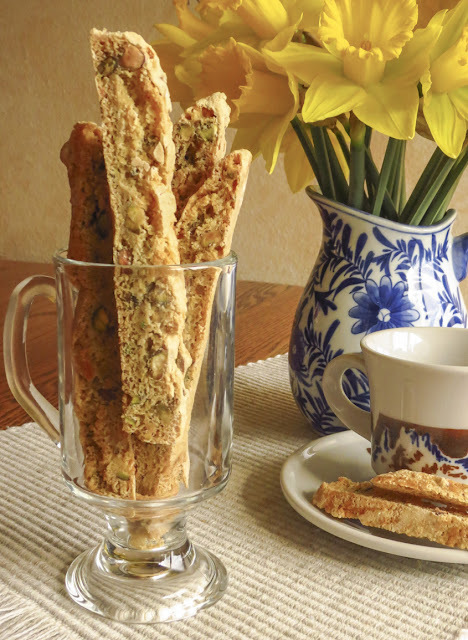 If you have a sweet tooth, drizzle the biscotti with a lemony powdered sugar glaze. On some days breakfast is about more than just food, and this week seemed packed full of those days. We were ready for some sunshine on a plate, light comfort food, sweet somethings. Breakfast crepes were a tasty solution. Bonus feature: the large blender filled with a recipe of sweet crepe batter made a stack of crepes that fed two of us for two breakfasts. 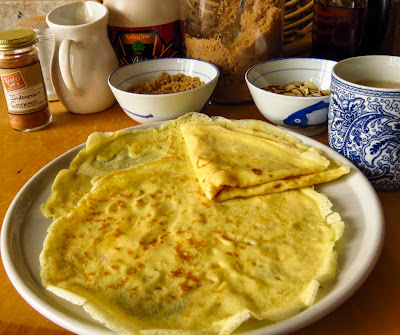 The first morning we enjoyed a pile of crepes, some lightly dusted with cinnamon and sugar and others filled with cherry preserves. They were a perfect light accompaniment to a bowl of fruit and cup of tea or coffee. The batter would have held in the refrigerator for a day or two, but it was easy enough to cook off the remaining crepes and store them in the fridge, separated with waxed paper, ready to reheat and use later in the week. 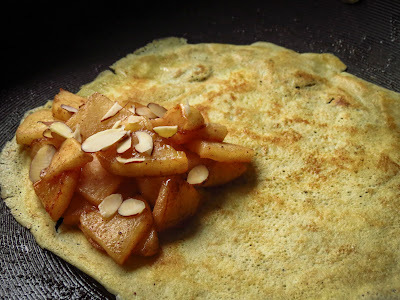 The remaining crepes were such a welcome treat this morning, warmed and folded, stuffed with cooked cinnamon apple chunks and a sprinkling of sliced almonds. These filled crepes didn't really need any syrup to boost the taste, but it is hard to resist a pitcher of warmed maple syrup sitting on the table. Cooked cinnamon apples, almonds, maple syrup... oh my, this was indeed sunshine on a plate. Just what a gray day, a busy day needed to get rolling, and it didn't hurt that it took almost no effort. Do these sound like delicious breakfast fare? 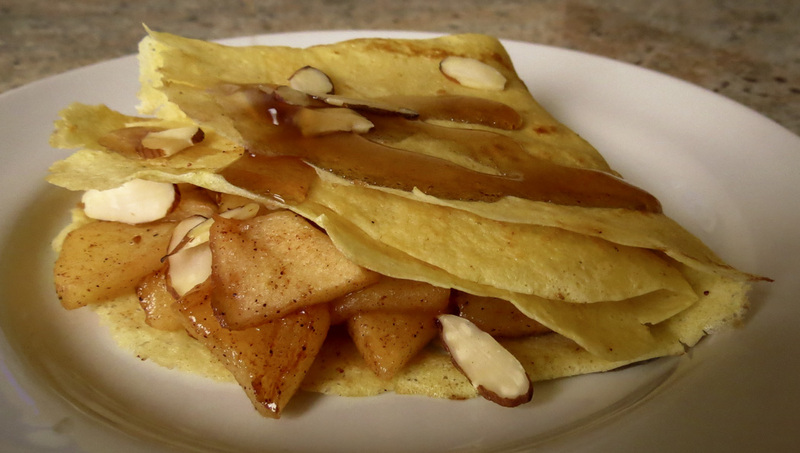 Just imagine how amazing an apple crepe would be for dessert, topped with a scoop of ice cream or brandy-flavored mascarpone! Heat a large pan over medium-high heat and melt the butter. Add the apples, sugar and cinnamon and sauté until the apples soften, about 5 minutes, turning frequently with a spatula. Set aside. Use a blender and combine the eggs, milk, sugar and vanilla. With the motor running add the flour and sugar, pausing to scrape down the sides as necessary. Heat a medium nonstick saute pan over medium-high heat. Brush the pan with a tablespoon of vegetable oil or butter. Add 1/4-cup batter, tilting and swirling the pan quickly to spread the batter and coat the bottom of the pan. Cook until the crepe is golden, about 1 minute. Loosen an edge and flip to cook the second side for 20-30 seconds until lightly colored. Repeat with the remaining batter. Lay the crepes out flat and place 1/4 cup apple filling on one quarter; fold in half and then half again to form a triangle. Reheat briefly in the oven or in the pan used for the apple filling. Sprinkle with sliced almonds (optional) and serve. Heated maple syrup or dusting of powdered sugar optional... but recommended. Stuffed grape leaves, oh yes, please! Dozens of those plump, glistening little rolls covered the counters, piled high on a platter and spilled over onto the tabletop as I played with several recipe variations. This renewed interest in filled grape leaves began with Faith Gorsky's terrific new cookbook, An Edible Mosaic, a treasury of her Syrian family-inspired recipes. 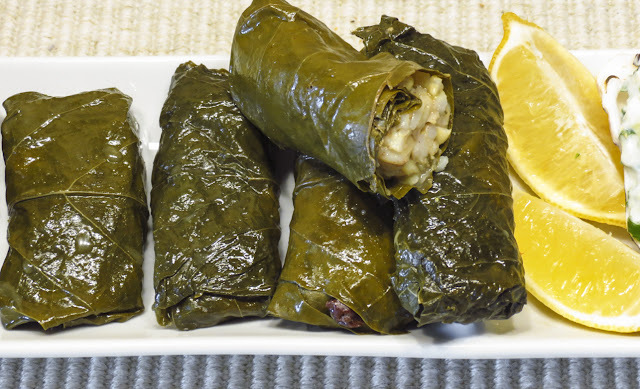 Vegetarian Stuffed Grape Leaves was the first recipe she selected for her cookbook: that fact alone makes them special. My Secret Recipe Club blog assignment this month was Sid's Sea Palm Cooking. Each month it's a new blog to explore, new recipes to investigate, and I happily browsed through Sid's ample archives. I checked out some tempting sweets (including a two-part post on making your own puff pastry! ), dozens of Danish specialties, a host of Mexican-inspired dishes, and then... listed under Cooking with Friends... I found it! Sid's Sea Palm recipe for Syrian-style Stuffed Grape Leaves. I knew this had to be my focus for March. Sid, I'll come back later to see what's cooking on your monthly Tapas Nights and Boat Club Potluck posts. I prepared two filling variations, one vegetarian and and the other meaty with a ground lamb sausage. After gathering the ingredients and spices noted in Faith's and Sids recipes, I skimmed Joanne Weir's From Tapas to Meze for a little more flavor research. In the end I selected a blend of seasonings we love and that were available in my galley. Soon I was busy mixing and rolling, having fun and up to my elbows in stuffed grape leaves and rice filling. Forming the rolls was easy enough; it's similar to wrapping up a burrito or a Spring roll. 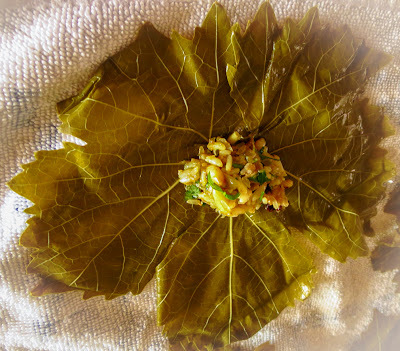 Add a dab of filling to the bottom third of a grape leaf just above the stem and shape the mixture into a cylinder; fold in each side and roll up firmly (but not too firmly or they'll burst as the rice expands) toward the top point. Stack the rolled leaves seam side down in layers in a heavy-bottomed pot. 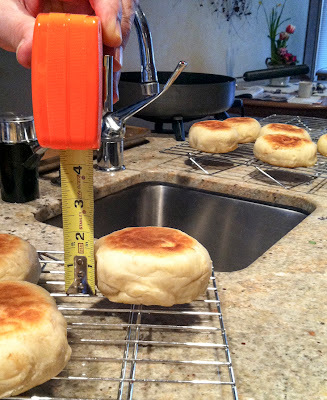 Weight down the top with a heavy plate or lid to keep the rolls firmly in place or they will float and unwrap. Cover with water, add a drizzle of oil and some lemon juice and simmer slowly until the rice is cooked. The rice-only vegetarian grape leaves were a treat, served cold as an appetizer, accompanied with a bowl of tzatziki and a few lemon wedges. 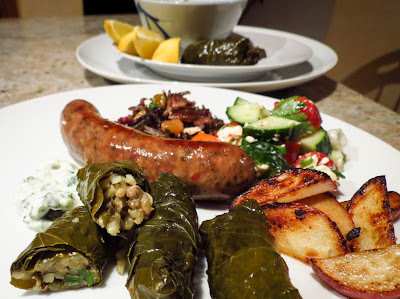 We enjoyed the meat-stuffed grape leaves at dinner, served warm with grilled lamb sausages, lemony roasted potatoes, Fattoush, and a bit of Wild Rice Salad. This recipe for meat-filled rolls makes three dozen stuffed grape leaves, enough to feed a crowd. Heat the oil in a skillet over medium heat. Saute the onion for a few minutes until soft. Add the spices, cinnamon through turmeric and a generous pinch of salt and pepper and cook until fragrant. Cool completely. Add the onion mixture and crumbled ground meat to a bowl with the rice. Toss in the next 6 ingredients, dried mint through fresh mint and combine everything thoroughly. Add more salt and pepper to the mix (optional). To prepare the jarred grape leaves, soak them in a pot of gently boiling water for 1 minute. Remove and transfer to a pot of chilled water. Do this at least once to remove the excel salt and processing chemicals from the leaves. Drain, pat dry and trim off any extra-long stems if needed. Lay a leaf out flat, shiny side down and ribbed vein side up, and place approximately one tablespoon of filling at the base of the stem. (Adjust the quantity of filling to the size of the grape leaf.) Shape the filling into a cylinder and proceed to fold and roll as you would a burrito or a spring roll: fold the bottom up over the filling, fold the sides in to cover, and roll up the leaf, tucking the edges in as you go. Roll into tight rolls, but not too tight or they will burst as the rice expands during cooking. Repeat with the remaining filling and leaves. Arrange layers of stuffed leaves packed close together, seam-sides down, in a medium-large, heavy-bottomed lidded pot. Place a heavy heat-proof plate on top of the leaves to hold them down while they cook. Add water to cover by about 2 inches; add 1/4 cup lemon juice and a splash of oil. Bring to a boil, then lower the heat, cover and simmer at a low bubble for an hour, or until the rice is cooked through. Let the pot sit awhile, off the heat, for the rice to absorb more liquid. To serve, drain the stuffed leaves in a colander, *but you might save the liquid in a bowl underneath. Accompany with plain Greek yogurt or tzatziki and some lemon wedges. Store any leftover stuffed grape leaves in the refrigerator. *One source recommends storing them in the reserved cooking liquid to keep the rice moist. I am wild about wild rice; the name alone suggests something tempting, alluringly exotic. It hints at a different taste experience well beyond that of the "regular" rices stocked at the local grocery. 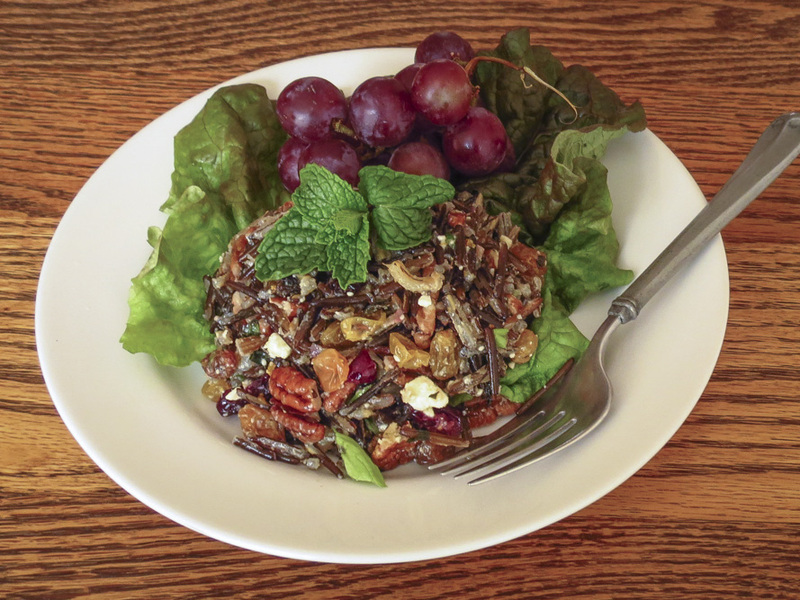 Wild rice is different, so different that technically it isn't even a rice. Nope, it isn't even genetically related. "Wild rice" is the common name given to an aquatic grass plant (Zizania) and the seed that it produces. 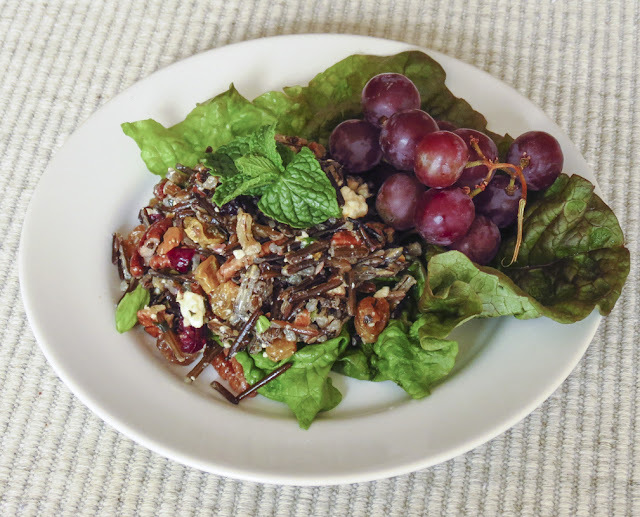 Wild Rice is America’s oldest grain and it is the only cereal grain indigenous to North America. Today's rice came from Canada, with a label boasting it was "natural grown, 100% lake wild rice, machine harvested by airboat." Minnesota is also renowned for its naturally-occurring wild rice, though my pantry holds a cultivated product, not hand-harvested from any lake or river. California claims title to producing the most wild rice in the world, cultivating the grain in huge paddies in the Sacramento River delta region. 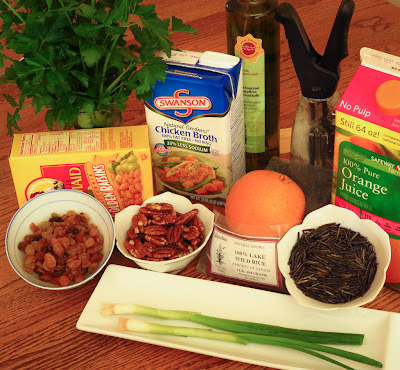 No matter what the origin, use whatever wild rice variety is readily available and affordable and let it contribute its woodsy flavor and chewy texture to a favorite recipe. 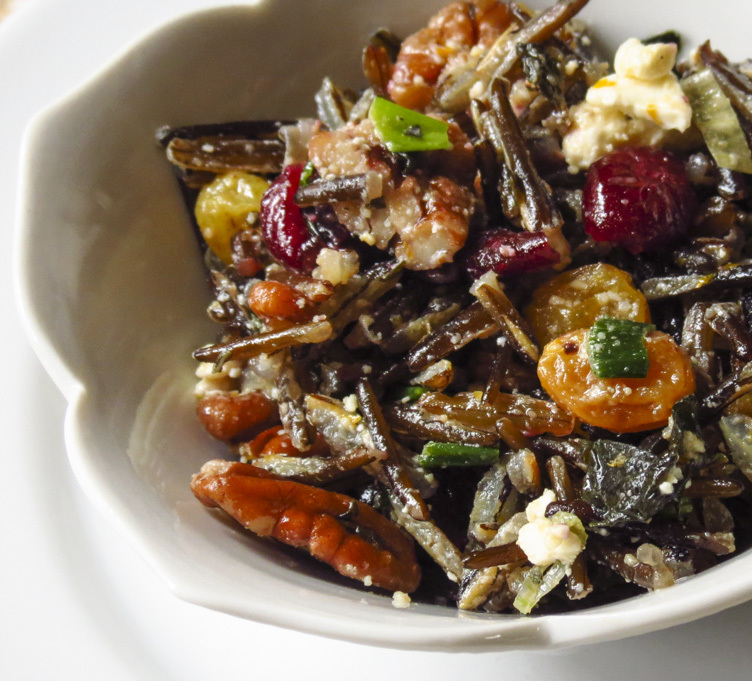 Wild rice is delicious when simply cooked in a broth, tossed with melted butter or a light vinaigrette, and dusted with grated parmesan cheese or a sprinkle of grated lemon zest. But today I craved big, bold flavors, contrasting textures, bright colors... I wanted a surprise in every bite. So forget the simple approach and layer on the flavors and crunch. ...and then I added a few more items, one by one, and taste-tested my way to the final combination. Hmmm, add a little more mint, then some feta cheese. Toss in a handful of orange-flavored dried cranberries to join the party, add some chopped Italian parsley and a big splash of lime. And so it went. Finally, this was it, a nutty wild rice salad that was yummy at lunch and even better as a late night snack after the flavors had more time to mellow and blend. Rinse rice thoroughly under cold water; drain in strainer. Place rice in a heavy medium-sized saucepan. Add the stock and bring to a hearty boil. Lower heat and simmer, uncovered, for 45 minutes. After 30 minutes check for dryness and firmness of rice - don't let it cook so long it turns too soft. Line a colander or strainer with a thin tea towel; dump the rice into the colander and drain. Transfer the drained rice to a mixing bowl. Add the remaining ingredients to the cooked rice and toss gently. Taste and adjust seasonings as needed. Let the mixture rest for several hours to allow flavors to develop and blend. Taste again and adjust seasonings again if necessary. Serve at room temperature. Whatever happened to Broccoli Cheese Soup? Sometimes a good memory should stay just that, a good memory. Trying to recreate a memory can lead to disappointment. And so it was with the memory of sharing a lunch of homemade Broccoli Cheese Soup with RL's mom, Irene, my mother-in-law. Why did that soup come up in conversation recently? I don't know, it wasn't one of her specialties that we remember particularly. 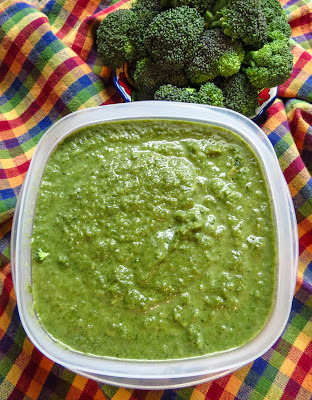 Whatever the reason, I thought of Irene and that soup when I had bags of broccoli in the fridge today. I used a recipe from Cooks' Illustrated and followed it to the letter. That alone should have guaranteed success. The soup was palatable, "perfectly adequate" and all that, but neither of us care to eat it again, not ever. Drum roll please, while I officially remove Broccoli Cheese Soup from my list of soups to prepare. We'll still keep our fond memories of meals with Irene, but without any broccoli soup connection.